The Lake District’s success in securing World Heritage Site status continues to attract international attention from writers and bloggers – most recently in the form of two highly respected influencers and photographers from Australia. 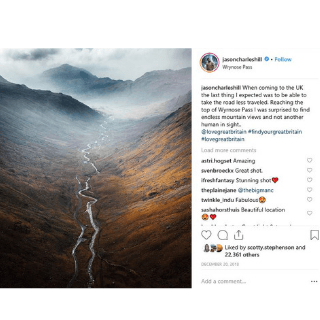 VisitBritain approached Cumbria Tourism to arrange a Western Lake District landscape-focussed itinerary for Jason Hill and Emilie Ristevski, who between them have an online audience of almost 1.7 million followers. “Shares” and “likes” of their posts resulted in a further boost of 1.2 million, bringing total reach and engagements to just under 2.9 million people. Together, Jason and Emilie explored the Lake District over five days, staying overnight in Cockermouth, Keswick and Ambleside. Thanks to the support of our member businesses who recognised the value in such trips, providing the pair with accommodation enabled this massive social media reach for Cumbria to be achieved worldwide. The trip was documented purely on Instagram, both during and after the visit, with several posts also gaining further exposure after being re-posted by VisitBritain on its Twitter channel – which boasts a further 385,000 followers. Emilie’s blend of travel and lifestyle photography means she enjoys an audience of predominantly female followers (68%) aged 25-34, based in the US & Australia. Jason’s pictures transport the viewer into his moments of tranquillity, with an even split of men and woman in the same age-range and locations. In the two months following their Lake District visit, Emilie and Jason have together attracted a further 156,000 followers to their Instagram accounts, firmly establishing social media as a real force to be reckoned with as an opportunity for great destination PR.